Objectives: The aim of this study was to check the vitamin D level in pregnant women in north of Iran (Rasht city) from spring 2013 till summer 2014. 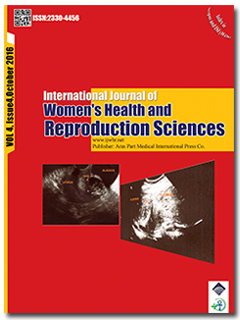 Materials and Methods: In a retrospective cross-sectional study, all pregnant women with any gestational age without receiving vitamin D supplement before 3 months of pregnancy from two private offices of gynecologists in Rasht were studied from spring 2013 till summer 2014. All data were collected, recorded and blood sampling was done to measure serum 25 (OH) vitamins D. Vitamin D deficiency and insufficiency was defined as levels of 25 (OH) D < 20 and < 30 ng/mL for pregnant women, respectively. All data were analyzed by descriptive and analysis tests. Conclusion: Vitamin D deficiency in pregnant women is higher in this area (Guilan province). Vitamin D supplementation can help to increase 25(OH) D levels. However, women should ideally start vitamin D supplementation a few months before getting pregnant.